Having a clutter free work space is an important piece of staying engaged with your work. 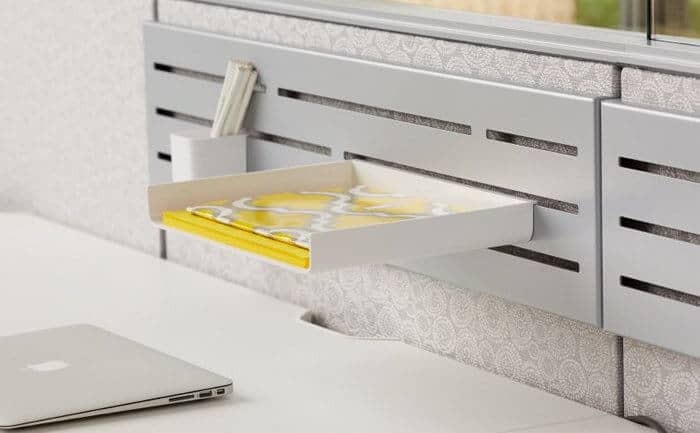 However, staying organized is a challenge with work spaces becoming more compact and offering less storage. Here are a few of our favorite solutions to maximize your organizational needs! Work styles are changing, and the contents of desk storage has shifted from paper files to personal items. The File Drawer Insert fits inside lateral file cabinets and creates two new functional levels of storage for all your belongings – from tennis shoes to tablets. The top level slides back and forth, making it easy to grab any item from your drawer. Furthermore, Belong Accessories are designed to give back to the individual through personal and customizable tools. The Belong line provides for personal work needs. Finally, NeatTech is an innovative cable management solution that complements our award-winning height-adjustable table Float, as well as other workstations. NeatTech stores power strips and cables neatly and safely off the floor to protect technology and restore order to the workplace. To see more of what Pacific Office Interiors can do to improve your work space click here.